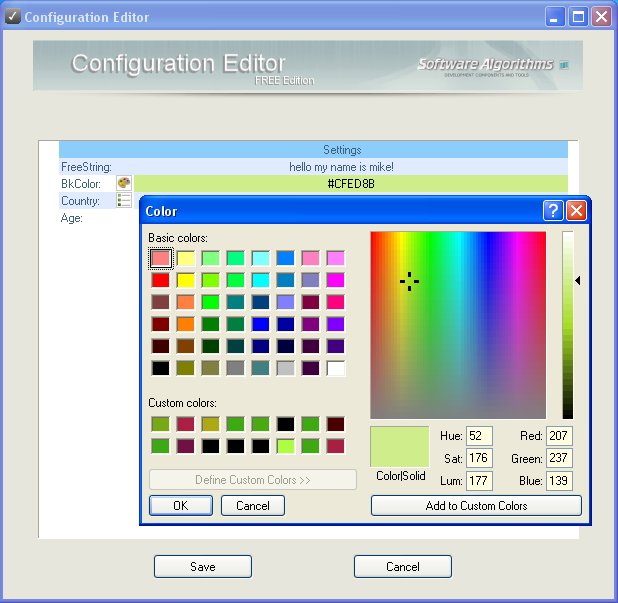 Configuration Editor FREE is a tool to be bundled with your own software, that will allow the user to edit your software settings file using a comfortable GUI (directly edits *.INI and *.Properties file types). It's meant for software developers that need a generic options editor component. - it is FREEWARE even for commercial use! All you need to do is put ConfigEditor.exe in your software folder, along with your software configuration file (to be auto-detected rename it to SETTINGS.INI or SETTINGS.PROPERTIES depending on the file type). ConfigEditor.exe reads the SETTINGS.INI file, and reads the keys and values from it. If a template file named SETTINGS.ITP exists, it reads it for the definitions of how to display each key and value pair. If this file doesn't exist, then it tries to auto-detect the type of each key and value. The values are displayed on a list, and the user edits them. When the user clicks the "Save" button, the new values are saved back to the SETTINGS.INI file. Can I distribute it with my commercial software? Yes. ConfigEditor FREE can be distributed and bundled in any way, totally free. see License for full details. Can I tell ConfigEditor to use another settings file? This can be done using command line parameter, for example: ConfigEditor.exe /INI:"C:\MySettings.ini"
See the Users Manual for further detail. How do i create an INI file? INI files are text files, they can be created and edited with any text editor, like Notepad. How do i make my software use ConfigEditor to edit settings? see the ConfigEditor SDK for further detail. Can my software control the ConfigEditor window? Yes, you can use the ConfigEditor SDK for that. Can I add more value types? ConfigEditor Pro has more value types, such as Drive selector, Window selector, Encrypted password (using MD5,SHA or Hex algorithms), USB or CD-ROM Selector, and a plugin system that allows you to add custom data. ConfigEditor is %100 free from spyware and adware. Can i change ConfigEditor colors or title image? To be able to change the title image, as well as colors and sizes, you may want to buy ConfigEditor Pro (which will also show you support ConfigEditor!). ConfigEditor source code can be purchased, as we feel the "purchasable source" approach provides the best of all GPL/MIT and commercial licensing: You can get the source code and feel secure you have %100 control of the product you use, and on the other hand, the maker gets compensation for the hard work, time, and money invested in the product. Free for both commercial and non-commercial use. See License Agreement for further details (CEFLicense.txt). Download ConfigEditor FREE kit, which includes ConfigEditor FREE, Examples, Documentation, and the SDK.